Anyone who has seen War for the Planet of the Apes knows the visual effects are astonishing. Even though you know you’re watching a bunch of ones and zeroes, you still get emotionally involved with the characters. But seeing the raw footage next to the final footage is something else entirely. Fox Home Entertainment released the amazing movie on digital download this week, with the Blu-ray and 4K coming October 24. 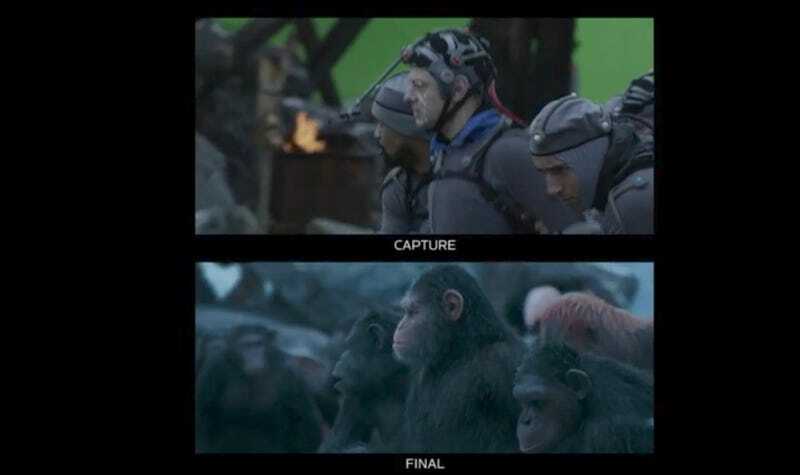 A standout special feature is several split screen scenes that contrast what director Matt Reeves shot on set with the actors in performance capture suits, and the finished film with those same actors transformed into apes. It’s truly remarkable. Here’s Caesar’s first kill. The body language, the facial tics—the way Weta Digital was able to translate all that is crazy. Here’s another one: the riot scene. It almost goes without saying that not only is the effects work here worthy of major recognition, but the performances and filmmaking are, too. No wonder Fox, which distributed the film, is going to push it for awards. War for the Planet of the Apes is available to download now and it’ll hit Blu-ray and 4K October 24.